The 5th annual Lead Follow Or Get Out Of My Way Ride went well, with only a couple minor hiccups. We had a rider and horse get a little too friendly with the local cactus. A lost horse that was found by a biker who actually left his bike and rode the horse back to base camp. The helpful biker was Mike Bilsky who happens to be a trainer at the barn where Jodie board's her horse. Then we had a fountain of our own, almost as big as the Fountain Hills one that flooded our P & R, In timer, and Ride manager area when the hose pipe broke and it took a while to get the water shut off. Otherwise the weather was fantastic. The 75 mile ride had a good turnout. We had a total of 105 riders, 9 from California, 5 from Colorado, 3 from Utah, 3 from Washington, 2 from Canada and the rest from Arizona. 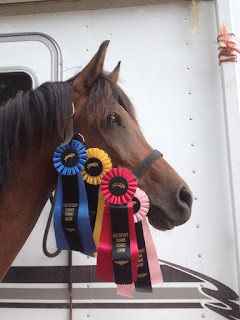 1st place awards were a nice halter and lead rope combo, B.C was a Zilco snap on trail bridle. Top ten was various types of stowaway saddlebags. Completion was a perfect sized zipper pouch for your vet card and essentials that can clip to your saddle and a tumbler with a lid and straw. 1st place in the 30 mile ride was Caliente ridden by Mary Morrow, Best Condition in the 30 mile ride was Lance ridden by Shery Babyak. 1st place in the 50 mile ride was Hallie Rey Oma (Hallie) ridden by Teresa Waddell, Best Condition in the 50 mile ride was Freda Baskin (Jantar) Ridden by Lancette Koerner. 1st place and Best Condition in the 75 mile ride was TK Tiki (Egypt) ridden by Dennis Summers. Thank you to all of the fun riders who participated in our ride. Hope to see you at our future rides. At ride meeting this year we surprised our 5 year volunteers that helped at the last 4 Lead Follow Or Get Out Of My Way Rides and Jodie's 1st ever Endurance ride to manage the AAHA Halloween ride with a award for all their continued help. This includes volunteers Tom Dukerich, Elizabeth Young, Jim Tilman, Debbie Fleming, and A.D. Williams. We also celebrated the riders that completed all 5 years with a personalized framed photo by ride Photographer Susan Kordish of our favorite photos of them. The riders are Aileen Baca, Barb Debi, Greg Rose, Valerie Savino and Bruce Weary. At ride meeting we also had our ever popular horse name drawing that you need to be present to pick out your prize. We like the idea that riders have a chance to win something extra without having to worry about where they place in the ride. We would like to also send out a huge thank you to head Vet Rick Poteste for vetting all 5 rides as well. We are so lucky to have such experienced, friendly and knowledgeable Vets including head Vet Rick Poteste, Greg Houser, and Mark Anderson. Thanks again to Kurt and Gina Lander sponsor’s from Renegade Hoof Boots for donating items to our raffle, the winners were Dave Wisniewski with a boot bag, Ellen Rosenberg won a vest, Troy Eckard, Cheryl Johnson, Sandy Dory and Pam Bingham won boots. Also, our additional sponsors: Power RV-Barb & Doug Clausen, The Long Ride, Lucian Spataro, A.D. Williams, Pet Club, Platinum Performance and Jan Mutchler. This ride would not be the success it is without the help of our volunteers. Volunteers can make or break a ride and are not easily replaceable. We had a grand total of 40 volunteers. We had positive feedback that most the riders were kind and pleasant to our volunteers. We thank the riders for that because it is so hard to get volunteers to help and we need to all be grateful to them. We were thrilled to have back with us Master timer Steve Powers to help make the vet check run smoothly. He stepped back into the roll like he never was gone. Trail markers were A.D. Williams, Clydea Hastie, Tammy Gagnon, Andrea Fix, Jacquie Martin, Amy Schnick, and Barb Clausen. Checkpoint volunteers were Jenny Powers, Amy Schnick, Danny Meeker, Debbie Fleming, Roger Taylor, Paula Prather, Jim Tillman and Jennifer Leckman. Base camp volunteers were Tom Dukerich, Elizabeth Young Julie Beltz & Mike McClaren, with our emergency horse trailer. New rider briefing was conducted by Jenny Powers. We are so lucky to have the Pre Vet students from Tucson. They were Kaitlin Dickson, Madie Seltzer, Grace Fell, Aiden Tansey, Melissa Morgan, Alli Meaux, Jasmine Acosta, Caroline Manrubia, Susana Torres, Hayli Burdsal, Ashley Hintze, and Mollie Wiegand. They did In timing, P & R, Vet Scribe and Out timing. Glow stick trail markers were Phil Martin, Susan Kramer and Bobby Kramer. Trail take down was Joe Jajack, Julia Lynn Elias, Cristina Winemiller, Cheryl Johnson, Dennis Summers, Sue Summers, Taylor Pashong-Walck, and Barb Clausen. As always thoughtful ideas of improvement are welcome and appreciated. Criticism and negative feedback are not necessary. We also want to thank you our riders for supporting our rides. Your rider packet had an entry to fill out for our Bumble Bee ride January 23 rd. Get your entries in soon. It wasn’t necessarily my best idea, but it seemed like a good training endeavour (for myself) to let my OTTB (OT) run as fast as he wanted through the single track trail at Golden Ears Park in Maple Ridge, B.C. My initial thought was that I should get used to not having steering or speed control while riding. I’ve also watched quite a few videos online about prior race competitors and their first rides on the Mongolian horses. I can only assume that the horses were rebelling from western control by trying to behead their riders by running under the tether ropes at break neck speed. Surely, if the new riders simply trusted their horses, they would have found a better way across the wide open steppe.